Offensive line depth is hard to come by, and a lack of it can derail your season. MANKATO — The moment that briefly apprehended Vikings fans during the team’s Saturday night practice at Blakeslee Stadium — the run play that put tackle Rashod Hill on the grass, holding his left leg — turned out to be nothing more than a “scare,” according to Hill’s agent Brett Tessler. Tessler tweeted on Sunday morning that Hill was fine after leaving Saturday’s practice, and isn’t expected to miss any time. Hill was able to stand up before the Vikings took him off the field on a cart on Saturday night, and he was back on the sidelines after a medical examination, so Tessler’s tweet served to assuage any remaining fears about a situation that could’ve been much worse. That it happened, though, provided another reminder of a grave reality most NFL teams — and certainly the Vikings — know all too well: Offensive line depth is hard to come by, and a lack of it can derail your season. The Vikings have already been without left tackle Riley Reiff for most of training camp because of a back injury, though coach Mike Zimmer has said it’s not serious. 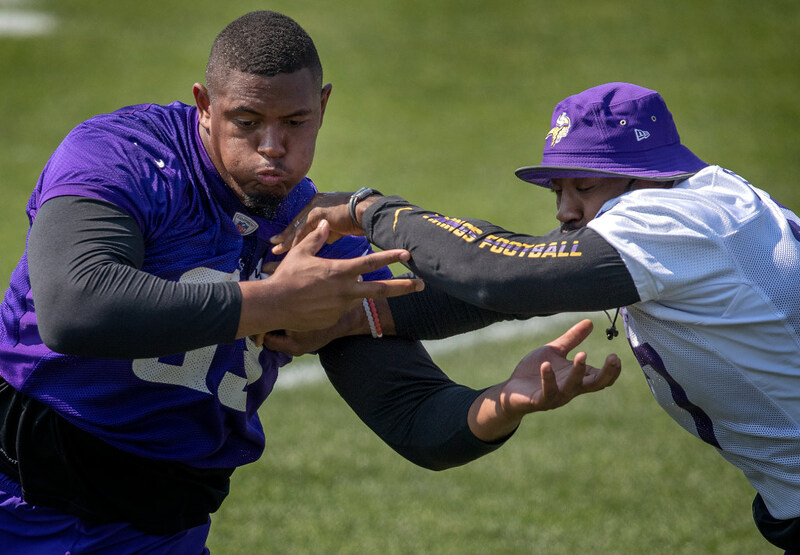 Hill going down meant the Vikings were on to their third left tackle of camp on Saturday night, putting Jeremiah Sirles with the first-team offense in his place. That’s not a bad solution, given the fact Sirles started 10 games for the Vikings last year, but he’s played mostly on the right side of the line and would seem a better fit there or at guard than at left tackle. Most NFL teams carry only eight or nine linemen on their 53-man active roster, which means their backups are inherently going to be generalists more than specialists. There wouldn’t be many teams that could survive the loss of their starting left tackle, let alone the rash of injuries the Vikings saw on the line last season. Still, it’s worth noting that though the team spent a third-round pick on Ohio State center Pat Elflein, it didn’t add a tackle in the draft and is working with essentially the same set of depth options it had at the end of last year: Hill, Sirles, Willie Beavers and T.J. Clemmings, who stepped in briefly as the No. 2 left tackle when Hill went down on Saturday.. The return of Reiff would ease many of the Vikings’ concerns, and allow the offensive line to begin coalescing after an expensive overhaul this offseason. With the first of four preseason games coming this week, though, the Vikings’ early scares — even if they turn out to be nothing serious — are a reminder that NFL teams can never derive too much comfort from their offensive line situation.